Cajun Jambalaye Recipes. Mouth Watering Flavor. 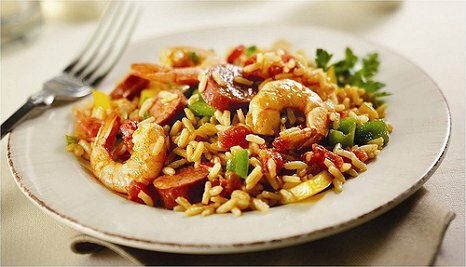 Cajun jambalaye recipes can be made with a variety of meats but this one with shrimp and ham will be excellent. You can also use sliced up sausage or dice up some chicken in place of the ham. Either way your guests will love it. The biggest problem you may have with cooking this cajun jambalaye in the campground is that you will need to keep the neighbors from scenting the wonderful aroma this delicious meal will give off while it cooks. Friends (and those who want to be ) will suddenly show up at your campsite finding any excuse to be invited so be careful. Here’s how to prepare the ingredients and to cook it up. Use a good sized skillet over medium heat. Cook the bacon until it’s nice and crisp. Place the cooked bacon on paper towel to drain. Drop the minced onion and the bell pepper into the bacon drippings and it should cook to tender after about five minutes. Add in the chicken broth, brown sugar and ketchup. Put the cover on and simmer for 15 minutes. Cut up the shrimp into smaller pieces and then blend in the ham and heat it through. Blend in the cold water and cornstarch and stir this well. Cook everything until it is nicely thickened and add the salt and pepper to your liking. Have the rice ready and then invite the real friends to the table and watch their faces glow with the first tastes. You may need to beat back those from the other campsites as they will not go away in a hurray when you prepare and serve Cajun Jambalaye Recipes. Hot biscuits smothered in butter will drive your guests into a frenzy. Enjoy. 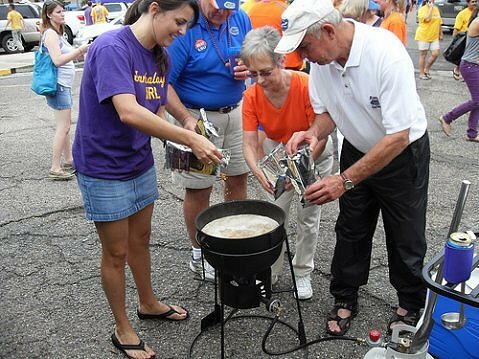 LSU vs. Florida Tailgate with Mike Serio and ADGAS Outdoor Cooking Products. Tailgating equipment includes ADGAS PC-10 Double Cooker and 4 Gallon Cast Iron Jambalaya Pot. Everyone wants to cook healthy chicken recipes, but we also love the great taste of an oven fried chicken recipe. You could try an easy chicken salad recipe. The beer can chicken recipe will get rid of a lot of fat but still maintain a beautifully moist meat dish. Our family loves a chicken alfredo recipe and when all of the leftovers remain we make some good chicken soup recipes and keep the soup in the fridge for later meals.